1. Lock cat inside an hour before departure. 2. Acknowledge that while it’s very clever that the three year old can unlock the cat’s door, she mustn’t do it right now. 3. Coax cat back inside and lock cat door again. 4. Pull down attic stairs to retrieve cat-cage, start to climb into 3.6 metre high ceiling. 5. Climb back down. Acknowledge that yes, the three year old is very good at climbing, but mustn’t follow you up. 6. Turn on Sesame Street, ply three year old with a treat, and put the baby (also keen to prove climbing prowess) in high chair with non-choking snack. 7. Pull attic stairs down again, retrieve cat-cage. 8. Watch cat freak out at sight of cage and run under bed. 10. Coax cat out from under bed. 11. Race toward the voice shouting “Mummmm! Tilly is stucccckkkk!” while being clawed by cat. 12. 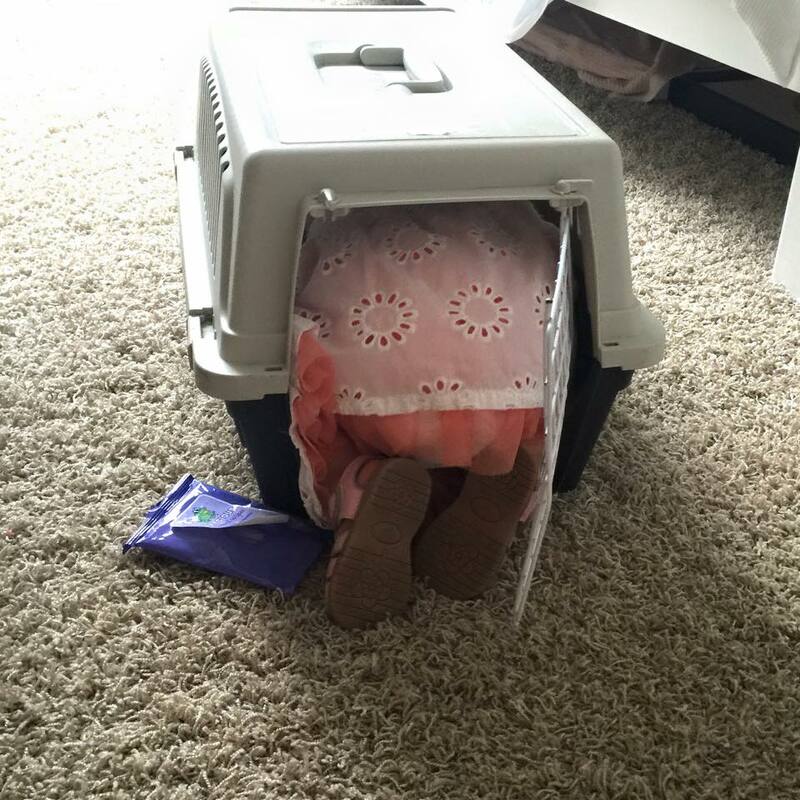 Discover baby stuck in cat cage. 13. Watch helplessly as cat wriggles free and dives under bed. 14. Take photo of stuck baby. 15. Send photo of stuck baby to husband for LOLs. 16. Bend back three fingernails while undoing the cage snaps to take the whole top off. 18. Coax cat out from under bed. 19. Grab baby’s leg as she tries to climb back into cage. 20. Stuff cat into cage. 22. Lock house and get into driver’s seat. 23. Remember cat still in cat cage in hallway. 24. Unlock house/grab cage/re-lock house (feels like one movement). 25. Strap cage in car.